All of us, whether religious, agnostic or atheist, are searching for meaning. 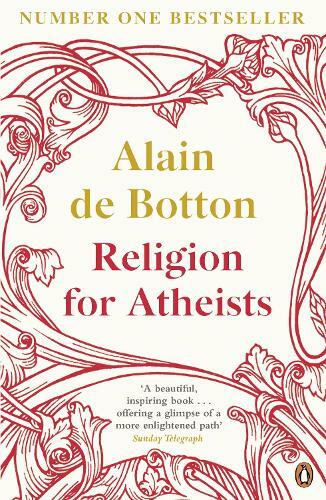 And in this wise and life-affirming book, non-believer Alain de Botton both rejects the supernatural claims of the major religions and points out just how many good ideas they sometimes have about how we should live. And he suggests that non-believers can learn and steal from them. Picking and choosing from the thousands of years of advice assembled by the world's great religions, Alain de Botton presents a range of fascinating ideas and practical insights on art, community, love, friendship, work, life and death. He shows how they can be of use to us all, irrespective of whether we do or don't believe. Praise for "Religion for Atheists"
"Quirky, often hilarious ...Focusing on just three major faiths -- Christianity, Judaism and Buddhism -- [de Botton] makes a convincing case for their ability to create both a sense of community and education that addresses morality and our emotional life." -"Washington Post "
"One has to appreciate his pluck as much as his lucid, enjoyable arguments, and this book, like his previous titles, is a serious but intellectually wild ride. If anyone can 'rescue some of what is beautiful, touching and wise from all that no longer seems true, ' it's de Botton." -"Miami Herald"
"[De Botton] demonstrates his usual urbane, intelligent, and witty prose, always entertaining and worth reading...this book will advance amicable discussion among both believers and disbelievers." "In earnest and lyrical prose, de Botton illuminates the practical functions of religion in a secular context...compelling." -"Kansas City Star"
"A wonderfully dangerous and subversive book." -"San Francisco Chronicle "
The author of Essays in Love and How Proust Can Change Your Life . Alain de Bolton makes a convincing case for an alternative to the blind worship of religion.